The website www.indianchristianity.com provides information and research assistance for topics dealing with India in particular and South Asia in general. It provides information to research scholars and guides via E-Mail, air mail post and through this world wide Website. The Editor of the St. Thomas Christian Encyclopedia of India (ISBN 818713206X, Lib. Cong. Cat. Card. No. 73-905568 ) and the Indian Church History Classics (ISBN 81-87133-04-X, Lib. Cong. Cat. Card. No.98-908360 BX4714.120 ) Prof. George Menachery was born at Kattur on April 2, 1938. After teaching university classes for thirty years he gave up the job as Head of the Department of Post-Graduate Teaching in order to concentrate on research and publication. At present he spends some time every year as Professor of Christian Art at the Pontifical Institute and Major Theology College, Alwaye. 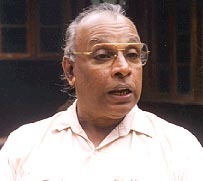 Connected with many institutions and organisations interested in the study of history and culture, he was executive member of the Kerala History Association (1975-90), Kerala Government Advisory Board of Archaeology (1975-82), University Senate, University Statutory Finance Committee, Kerala Sahitya Academy... He is vice-president of the Church History Association of India CHAI. He is also an executive committee member of the Expert Committee for the study of the Churches in Kerala, Directorate of Census Operations, Kerala (Ministry of Home Affairs, New Delhi) and a member of the Governing Body of the Christian Chair of the University of Calicut. He was also the national vice-president of the Newman Association of India-Pax Romana (1964-72), founder director of the Institute for Lay Leadership Training (1967-the present), founder director and curator of the Christian Cultural Museum (from 1980), member of the (Arch)diocesan Pastoral Council (1978 – the present), president of Kalasadan (1984-1992) ...He has to his credit a large number of publications, research papers, articles, radio talks and TV programmes. His research activities and lectures have taken him to more than 25 countries in 4 continents. At present he is engrossed in the work of completing the third volume of the Christian Encyclopedia, and the second and third volumes of the Church History Classics, and in setting up a comprehensive Indian Christian Museum. While not travelling in connection with one of these projects he is to be found at the ancestral family seat in Ollur, browsing in his huge library of rare books and collection of artifacts or pottering around the orchard. Detective stories and Parippu Vada are major weaknesses.